Warthogs are relatively large wild pigs who make their home in a large expanse of savannas, woodlands and scrub brush in Sub-Saharan Africa. The animal is named after its eye-catching facial "warts" and best recognized by canine teeth that appear as long, curved tusks. Smart, stout and sturdy, warthogs prove to be one of Africa's most durable and enduring species. With an estimated population of 250,000 warthogs calling various regions of sub-Saharan Africa home, these animals are not considered a threatened species. Still, they are often killed due to their habit of eating human-grown crops and their ability to carry a form of devastating African swine flu. Their numbers remain strong largely due to the animals' amazing intelligence and adaptability. For example, warthogs normally forage for food during the hours of dawn and dusk. However, those warthogs living in areas where hunting becomes more aggressive will learn to forage under the cover of night. 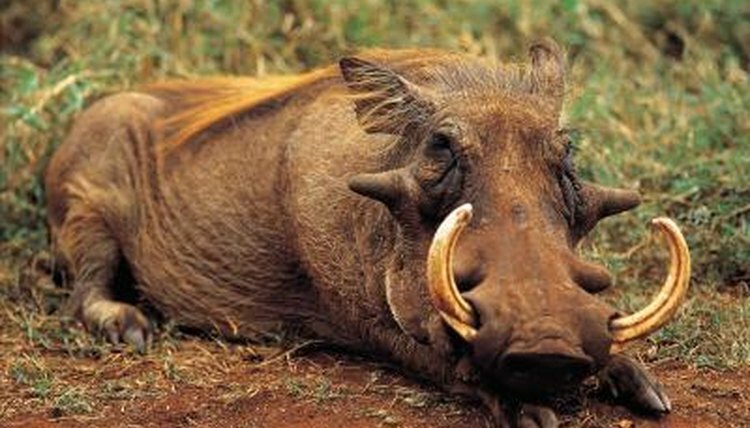 Unlike animals who have the luxury of waking up slowly in their nests, caves or dens, warthogs are often on their feet as soon as they open their eyes. This is due, in part, to the fact that warthogs have a tendency to take over and move into other animals' burrows, some of whom might not be ready to give up the space. What's more, warthogs that awake to a sense of being threatened find it best to charge from their hideouts at top speed in an effort to surprise any predators that might be lying in wait. Unlike most swine, warthogs are built with relatively long legs that allow them to reach speeds of more than 30 miles per hour. However, a number of powerful warthog predators, including lions, hyenas, and eagles, make escape somewhat challenging. That said, when cornered, warthogs are willing to put up a fight, making use of sharp lower canine teeth that resemble tall, piercing tusks as weapons. Warthog snouts are sensitive instruments that allow their owners to smell for food that lies beneath the surface of the earth. A warthog will commonly kneel and shuffle along the ground, nosing the dirt in its search for a meal. Once a warthog has found something of interest, it will use the strength of its snout to dig out whatever food it finds appealing. Female warthogs, or sows, tend to be far more social than their male counterparts, known as boars. Sows and their piglets live in groups of up to 40 warthogs, communicating by way of squeals, growls and snorts. In turn, males are known for the own rhythmic constellation of grunts that make up their mating calls.